OvR BRINGS CHILL TO MOUNTAIN CREEK!!! We’re super HYPED to be helping the CHILL NYC CREW get to Mountain Creek for SHREDFEST and all season long!!! Join us this Sat. 2/7 for SHREDFEST and support this awesome shred inspired organization, all while having a great day out on the slopes! Chill NYC was established in 1998, a year after The Chill Foundation’s inception in Burlington, Vermont. 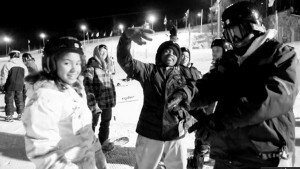 Since their first season, Chill NYC has helped over 1,000 underserved youth across New York City build self-esteem and life skills through participation in snowboarding and other board sports. The program’s transforming effect on how youth view their own potential and the possibilities in their lives has been evident and inspiring. The Chill NYC on-snow program operates on Tuesdays and Wednesdays with participant pick-up sites in Brooklyn, Manhattan and the Bronx. The entire program is provided at no cost to the youth or agencies involved. What Chill NYC needs to help continue to operate is your help, and that’s what SHREDFEST is all about!!! The ShredFest is a day of riding with the community of the New York City area, hanging out and “making turns” at Mt. Creek Resort. All money raised will directly benefit the New York City CHILL program. This year the event will coincide with BURTON’s Mountain Festival at Mt. Creek. So you can bet there’ll be lots of gear to try out, free product giveaways and many other draws throughout the day. We’re proud to serve as partners and supporters of Chill NYC, providing transportation for their on-snow program. Now with SHREDFEST approaching, we couldn’t be more psyched to get the OvR Snow Bus on the road for this great cause! WE WANT YOU TO SHRED WITH CHILL!!! IT’S GOOD TURNS FOR A GREAT CAUSE!!! IF YOU CAN’T MAKE THE TRIP BUT ARE INTERESTING IN DONATING TO CHILL PLEASE CLICK HERE. This entry was posted in Chris's Blog, Events, Fundraiser, Gear, News, Trips and tagged Chill, Chill Foundation, Chill_NYC, Chill.org, Mountain Creek, New York City, Nike Snowboarding, snow, snowboarding. Bookmark the permalink.